We’re home from D.C. and had such an amazing time touring around our nations capital. So incredible to see all of the historic sights in person!! Today I’m sharing a look that’s one of my favorite to date! I’m always a sucker for a tulle skirt, especially in pink! Also, I’m sure you’ve noticed that straw bags are the hottest trend for summer! I just got this one and this one (under $200) for the season!! I hope you all have a wonderful Monday, thanks for stopping by! I love how feminine this outfit is! So pretty! Such a lovely outfit! That skirt is such a beautiful color. Such a cute look! DC is so pretty this time of year!! It was so gorgeous! I wish we had more time there, but it’s good to be home! Beautiful white and pink!! You look gorg! And that Prada bag is so cute! I love this top! And it’s perfect with this skirt- so cute! I love your bag so much. and the whole outfit aswell. Loving your outfit and color combo! Loving everything about this outfit! That top is perfection. I love this top! It’s perfect for summer! Love that lacey top! It looks like a good piece to help keep cool on hot days. It looked like you guys had such a wonderful time back East. Loved your segway adventures lol. And I love this outfit – I need that top! It was such a fun time! I can’t wait to go back! You look stunning! 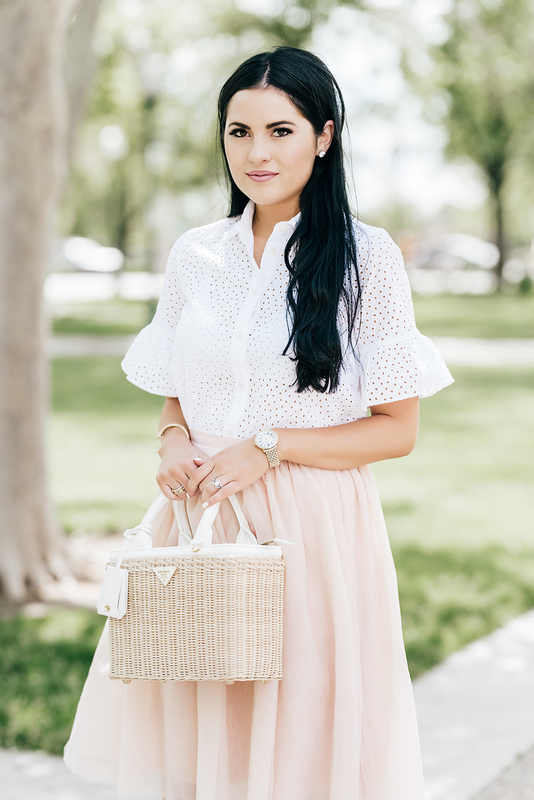 I love mixing white and blush together. This look is so dreamy. Love all the details of your beautiful outfit. What nail color are you wearing? I’m looking for a pretty white for summer. Thanks! 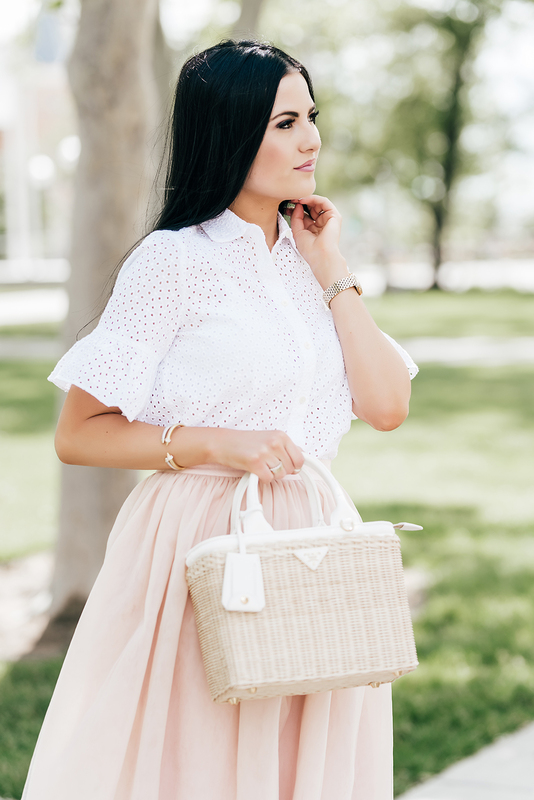 I love this eyelet top with your skirt! So pretty! I’m glad you had a great time in NYC & DC, girlie, it was fun watching what you and your crew were up to this weekend :) I love this outfit, it’s so cute and feminine, that Prada bag really enhances the whole spring/summertime vibe. Thanks so much for sharing and I hope you’re having a great start to your week so far! We had so much fun!!! Seriously, I already can’t wait to go back! Thanks so much :) Hope you’re doing well! Beautiful top! Love the whole look. That skirt is absolutely beautiful, I love the soft pink colour paired with white. I knew right away it would be from your line, your clothes are gorgeous! Hopefully you will ship to New Zealand one day! Gorgeous outfit! Love the feminine and blush colours! Beautiful! I love all of the neutral’s! Such a great color for spring and it looks stunning on you!